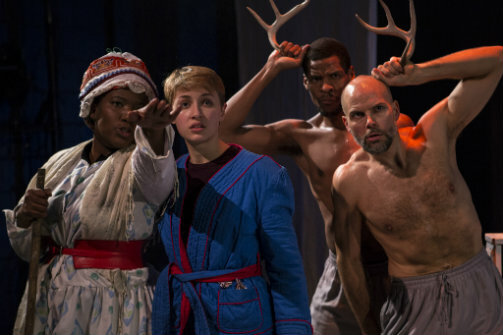 Celli Pitt, Nancy McArthur, Rich Brown, and Joshua Wynter in The Snow Queen. Photo by Maria Baranova. BOTTOM LINE: Blessed Unrest's The Snow Queen is an ode to friendship in this highly kinesthetic approach to Hans Christian Anderson's tale. With the wind chills hitting subzero every other day, there really isn’t a more weather-appropriate show than The Snow Queen. Blessed Unrest brings Hans Christian Anderson’s enigmatic tale of friendship (and perhaps the evil of low temperatures) center stage, in the company’s signature, highly physical style of storytelling. In this story that might have been the grandmother of Disney’s mega-hit Frozen, we meet the ultimate besties, Gerta (Nancy McArthur) and Kay (Todd Grace), as children. The pair spends every waking second together on the rooftop of Kay’s house, talking about nothing and everything, decoding the secret code within rose pedals, and forgetting dinners. Kay’s grandmother (Celli Pitt) lovingly scolds them for being carefree spirits, and the two carry on their joyous lack of a single care in the world. That is, of course, until a gust of wind carrying shards of magical glass blows across the land. Two of those shards end up hitting Kay—one in his eye, and one in his heart. And thus Kay is transformed, his cheerful sweetness replaced by bitterness, and he sets out into the unforgiving cold to search for the Snow Queen, a journey that would eventually make him devoid of all feeling. Of course, our heroine goes after him like the loyal friend she is. On the way, Gerta encounters a pair of wisecracking crows, a woman with a gorgeous garden, a wise princess, and a band of pirates. In this story where roses and wood doves speak words of hope to the pure-hearted girl, our heroine’s perseverance does not go unrewarded. The princess, touched by her, gifts her with proper clothes for the cold, and the pirate girl is also softened by Gerta’s fierce loyalty: a friend, that’s something the pirate girl longs for herself. The fairytale has a satisfying ending: the warmth of Gerta’s friendship thaws Kay out of his cruel stasis and the two return home, victorious and grown up. Although titled The Snow Queen, the presence of the goddess-like matriarch is little more than an enigmatic illusion. Sydney Maresca’s luscious costumes create a regal figure, along with the production's elegant choreography, a staple of Blessed Unrest. However, aside from her unintentional act of violence (the Queen tries to destroy her evil glass, thus making Kay an accidental victim), she is hardly a full-fledged villain. Her existence, in a way, is perhaps as omnipresent and unpredictable as depression, as it becomes more difficult to avoid her shards of glass in colder climes—which could be read as a metaphor for seasonal affective disorder. As a family-friendly stage play, the production is well crafted and will delight adults and children alike (the frequent laughter from the younger audience members proved that). However, it often seems that The Snow Queen wants to dig into something more complex and metaphorical, yet is constrained by the overly simplified plot of the original fairytale. And the protagonists appear unchanged even to the end. Of course, the most moving part of this tale has more of a nostalgic taste. Gerta goes to the end of the world to search for her friend. Is he worth that much? Kay could hardly answer that question. But perhaps the question is irrelevant, especially for children. Friendship is a powerful thing, and it really shouldn’t be measured, or evaluated. I will go to the end of the world for you. Why? Because you are my friend…isn’t that enough? The Snow Queen is by Matt Opatrny, based on the story by Hans Christian Andersen. Directed by Jessica Burr. Costume Design by Sydney Maresca. Sound Design by Beth Lake. Scenic Design by Sam Vawter. Lighting Design by Jay Ryan. The cast is Rich Brown, Tatyana Kot, Celli Pitt, Joshua Wynter, Nancy McArthur, and Todd Grace.